In honour of Reggae Month, we decided to talk to some of the players in Jamaica’s music industry to get their views on the impact of Reggae, as well as how their work contributes to this effect internationally. This week, we talk to Alex Morrissey, the innovator behind the popular website jamaicansmusic.com. diGJamaica: Tell us a little about the vision behind Jamaicansmusic.com. Alex Morrissey: As avid fans and lovers of Jamaican music, our pursuit and vision is simple: uniting Jamaican music lovers under one umbrella; having Jamaicansmusic.com as the place one thinks about whenever the words ‘Jamaican’ and ‘music’ are referred to in the same sentence/context. diGJamaica: What kind of impact do you think the website has had since its inception? AM: It’s forcing people to think outside of the norm and I say that as no disrespect to anyone. Readers/viewers want information that appears to be specifically geared towards them and not towards a generalized populous. For example: interacting with people via social media, we ask what they want to see and we give it to them. At events, we’re giving them a real-time, front-row experience, while the written content on the site always tries to give them something more. Granted, I’m not saying we’re the only ones doing this, but we’re the only ones doing it the way we do (which we’ve seen other persons now attempting to duplicate). 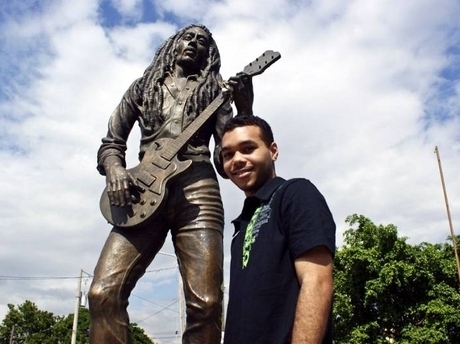 diGJamaica: There are a lot of websites where people can find Reggae music and information. What sets Jamaicansmusic.com apart? AM: Apart from the fact that we’re the only Jamaican music website that is just shy of three million likes on Facebook (chuckling)? We are truly an unequalled mega hub for all things Jamaican music related – spanning music, videos, interviews, artworks, tracklists, and news, sitting as a website primarily focused on documenting the dynamic and ever-shifting persona of Jamaica’s rich musical landscape. Visiting the site, you can find almost any information you want, but not a duplication of what is already out there. We really aren’t trying to be comparable to a lot of sites out there, but more so aiming to bring something new to the table at all times and people seem to appreciate our forward thinking nature. diGJamaica: When did you feel that the site had officially ‘made it? AM: To be honest, I think the website is yet to have ‘made it.’ We recently celebrated our sixth year anniversary and have garnered a number of accolades over the years, but there’s still a lot of growing left to be done, still a lot of accomplishments to annex to our name, still a lot of milestones to reach, which we are attempting to reach within the near future. diGJamaica: Why is a website like Jamaicansmusic.com important to the continued popularity of Reggae music? AM: That’s just it; we’re not trying to solely catalogue and preserve the popularity of a specific genre, but Jamaican music in a generalized context. Granted, Reggae and Dancehall are the forerunners of Jamaican music today, but we can never neglect where the music is coming from – everything from the early 1900s with Folk music and Mento, to the early beginnings of Ska, to the inception of Toasting, to the dynamics of Dub and the smoothness of Rocksteady, while showing the evolution as the years pass. So why is the site important to the continued popularity of Reggae? Because it’s reiterating the importance of the genre’s predecessors and, in doing so, we better emphasize just why Reggae/Jamaican music is the global influencer it is today. 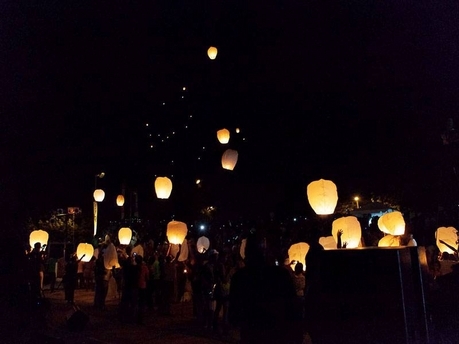 Lanterns being released at last year’s Earth Hour concert. diGJamaica: You staged your first event, the Earth Hour concert, last year. Tell us a little about the decision to create an event, how you feel about the response to it and the plans for this year’s staging. AM: As the company grew, we were always looking for ways we could give back on a local and global basis. We started out with our scholarship program and that is going well. But we felt we needed to do more. We knew of the Earth Hour initiatives for a few years now (we normal shut the site down for the ‘Earth Hour’ itself) and realized that a lot of persons in Jamaica really didn’t recognize the global movement. So we decide to share the messages surrounding the initiative and what better way to do it than through music? The first staging was really overwhelming in terms of the support we got from sponsors and the patrons loved it, especially considering the fact that we took only a month to plan the event. So for this staging, we want it to be bigger and better, more organized and executed the way patrons should experience a concert. For now, I have to remain tight-lipped about what we’re planning exactly, but expect a great showcasing and remember it’s FREE with a ticket and $500 contribution without. diGJamaica: Are there plans afoot for other Reggae events? AM: I wouldn’t say other Reggae events per se, because we’ve carved out a niche with the Earth Hour Acoustic Concert, so we’ll stick with that. With that being said, there are ideas looming in our minds of expanding to another city and hosting a simultaneous concert and possibly/eventually expanding to the wider Caribbean, but we’re just taking it one step at a time. We’re actually getting ready to launch a solely Dancehall-oriented project which we’re very excited about. And maybe we’ll have a concert in celebration of our Dancehall stars next year – who knows? diGJamaica: Do you think it is important for us to celebrate our music with observances like Reggae Month? Why or why not?